As I always do on the way home, following a short visit to the San Francisco Bay Area, I take in at least one of the National Wildlife Refuges (NWR) found in the Sacramento Valley. I usually stop at the two refuges that have easily accessed auto tour routes, the Sacramento NWR and Colusa NWR. California is blessed with 51 NWRs and Wildlife Management Areas (WMA), second only to North Dakota with 77. You can check your state’s refuges here, listed by state. 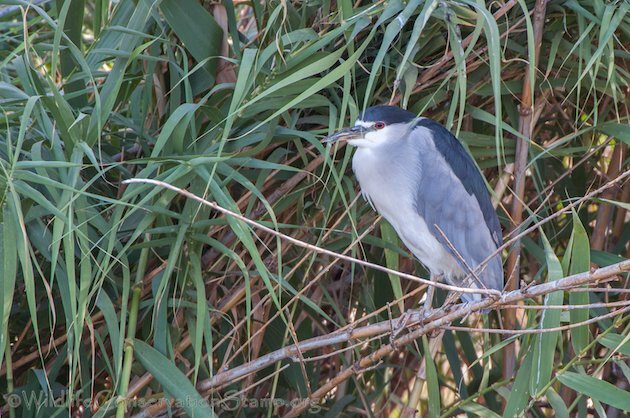 One species I can always count on at Colusa NWR is the Black-crowned Night-Heron (Nycticorax nycticorax), which boasts a large resident population. Click on photos for full sized images. I was pleasantly surprised to see that Colusa NWR was beginning to fill its impoundments during this drought, and there were quite a few ducks and geese present. I also spotted Red-tailed, Red-shouldered and Cooper’s Hawks on the 3 mile auto tour route. Just before the final leg of the auto route, where it begins to turn back toward the Black-crowned Night-Heron roost, I spotted a substantial group of large white birds foraging just off the road. There had to be at least 100 or more, and when I got closer, I was excited to find several Cattle Egrets (Bubulcus ibis), a species of which a decent photograph had always eluded me. 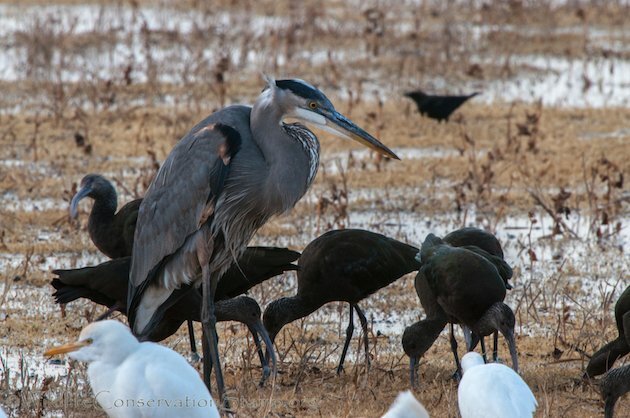 I was mesmerized watching these several different species, all foraging in this shallow wetland habitat. 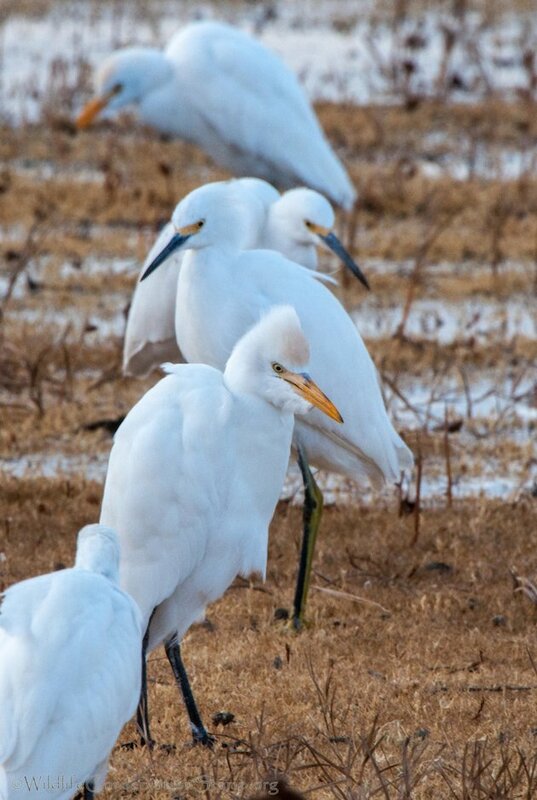 There were not only Cattle Egrets and Great Egrets (Ardea alba) but Snowy Egrets (Egretta thula) as well. Along with Great Blue Herons (Ardea herodias) and White-faced Ibis (Plegadis chihi). They were all foraging in the same area with very little apprehension between the species. The only scuffles I witnessed were between conspecifics. 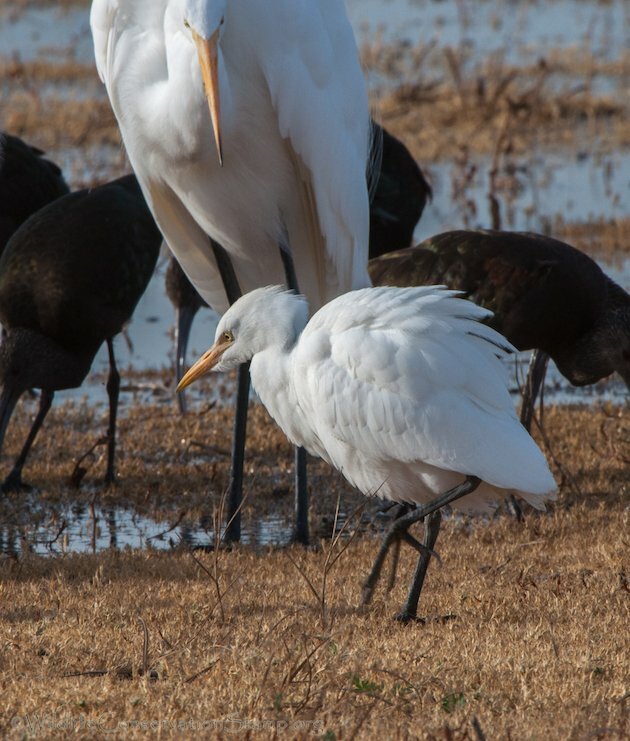 Like these two Great Egrets having a little territorial discussion. Most of the time the birds were concentrated on the invertebrates they all seemed to be locating and gobbling up continuously. 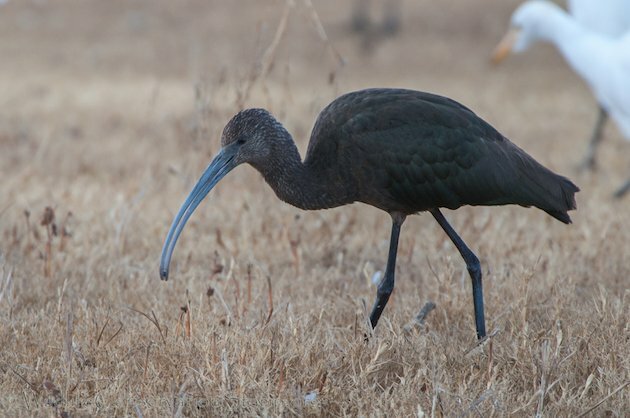 The White-faced Ibis were so busy foraging it was difficult to get a photo of them with their beak out of the ground. This one has a small tidbit held in the very tip of its beak. 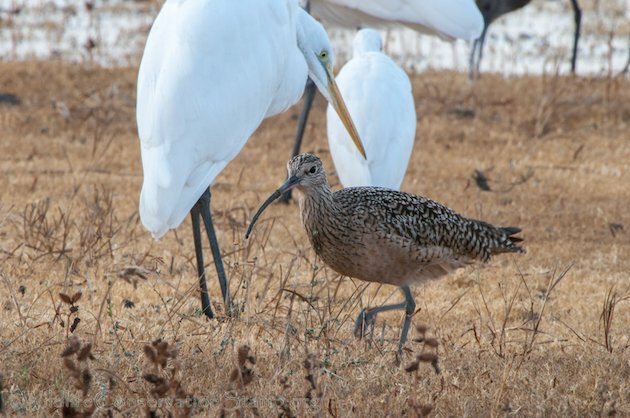 There were also several Long-billed Curlew (Numenius americanus) who joined in, mostly keeping to themselves. 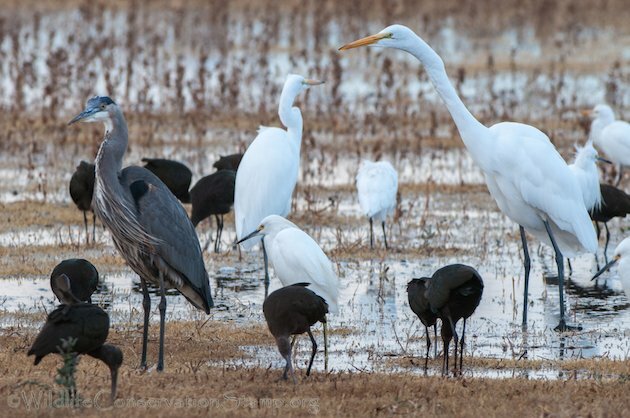 This incredible group of birds foraging in this wetland created an amazing jumble of sound. Mostly the gurgle of the larger egrets and heron, but over and above this inconsonant symphony, was the primal call of over fifty Sandhill Cranes (Grus canadensis) far off in the distance. I caught this encounter between one of the cranes and the smaller Great Egret. 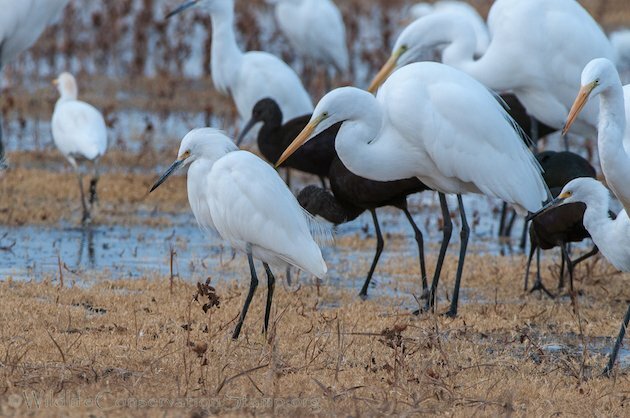 It appears that the egret is holding its own. I have put together a video to help you feel the experience I was a privy to on this beautiful fall morning at the refuge. I’m hoping this will give you an incentive to get out and experience a National Wildlife Refuge in your area during this fall migration. There are over 560 National Wildlife Refuges across the United States, at least one in every state. 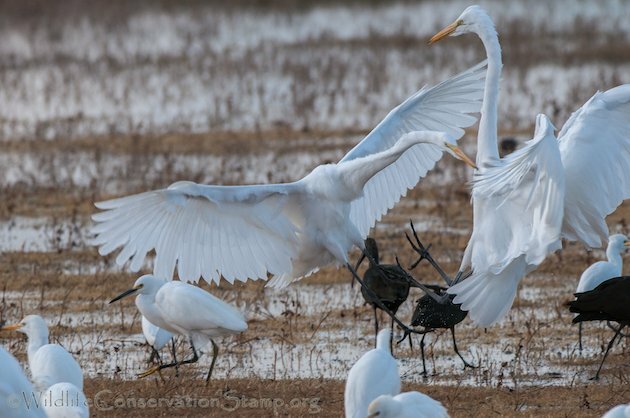 If you are passionate about expanding and preserving our National Wildlife Refuge System for future generations of birders and wildlife enthusiasts of all interests, please consider adding your name or organization to our list of supporters at the Wildlife Conservation Stamp Project. You may have noticed the gun shots in the background of the video. It is hunting season, so if you want to enjoy one of our refuges without listening to guns blazing, from September through January (yes, that is five months out of the year) check with your local refuge staff, or their website, to find out which days are non-hunting days. Colusa NWR allows hunting Wednesday, Saturday and Sunday. Thanks for another exceptional post with amazing photos! 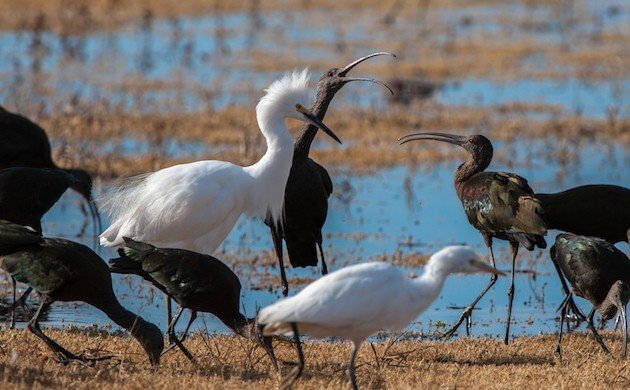 Those ibises are extraordinary. It seems shocking to me that people can hunt on these “refuges” five months of the year. So glad to know that the Central Valley has some water for birds. Thanks for posting the video and great pix!